International road racer Gary Johnson added to his fine record at the 2018 Macau GP by recording a fifth place finish on Saturday. 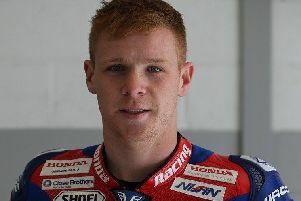 The Lincolnshire rider Gary Johnson was riding the Lee Hardy Racing, Briggs Equipment/RAF Reserves BMW on which he contested the Isle of Man TT and the North West 200 races earlier in the year. The 38-year-old from Broughton, near Brigg, has seen success over the years at Macau with a best result of third in 2013, and a couple of fourth and fifth places to boot. This year’s result meant he retained his record of never having finished outside the top five. Johnson completed his qualifying in fourth place and began the race from the second row. As the lights went out at the start of the race, Johnson got away well and moved up into third place behind Michael Rutter and fellow Lincolnshire rider and eventual race winner Peter Hickman. But his position was short-lived as both Danny Webb and Martin Jessopp made successful passes. But he maintained fifth place as the top five riders pulled clear of the pursuing pack. A two-rider crash involving Lincolnshire rider Phil Crowe and Ben Wylie who luckily suffered only minor injuries, brought the race to an early end with results taken from positions at the end of lap eight. Johnson was awarded fifth place, less than a second adrift of Webb in fourth position. The strong result at Macau concludes Johnson’s race programme for 2018 on a high, and he will shortly be in a position to announce his plans for next year.